I have been working on a few projects for another swap I’m doing on Ravelry at the moment. The theme is Super Heroes, and I don’t really want to post pictures of those projects until after they’ve been received in case I’m being stalked for information! So you’ll have to wait a little while for those pictures. I’ve been working hard on them and they’ve been taking up most of my time! But, you’re all in luck! I have also been unable to put down some of the beautiful new fibres I came home from the craft fair with, so I thought I’d show them all off to you! Though I’ll begin by telling you about the one lone, single, solitary, button which is also in the picture below. I purchased it from Luena and the photo just doesn’t do it justice. It’s made of shell, so when the light catches it at just the right angle it glows with all the colours of the rainbow! I couldn’t leave it there, and I think it will make a wonderful statement piece or brooch! Maybe I can turn it into a shawl pin? All 3 yarns I got were from Bart & Francis who just have the most amazing and inspiring collection! We spent a fair amount of time in front of their stall listening to all the technical aspects of how the yarns are made and put together. 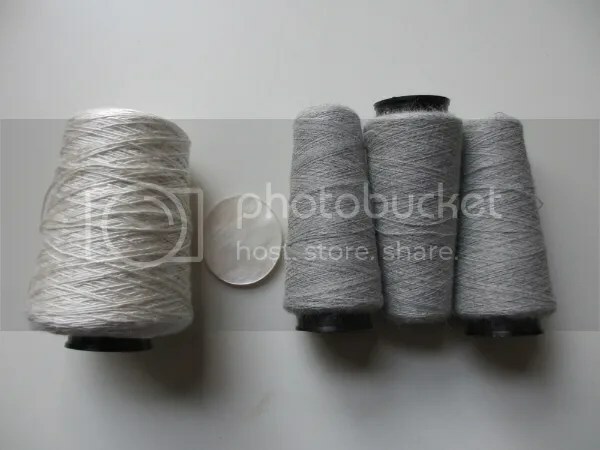 I hadn’t left myself enough budget to purchase any of the really fancy yarns (think; brushed silks, mohair, cashmere …) But I couldn’t walk past the cobweb weight baby alpaca (right), and when I got to the register there was the impulse purchase of the 100% Mulberry Silk (left)! The silk impulse purchase was aided by the scarf they had made up by the register which showed off the luster of the fibres to perfection! My photo doesn’t do it justice at all unfortunately! Also by the register was my other impulse purchase. The Silk Shantung. It’s so fine, so delicate, and yet, being silk, a really strong fibre. The swatch piece they had made up to show off fabric made from the yarn, was soft and airy and with a simple but regular pattern. This showed off the texture of the yarn to perfection! Hence, upon coming home and having a quick flick through my stitch dictionaries, I cast on immediately. This is the perfect knit night piece. It’s easy to follow, and quite a brain dead knit being only 3 stitches in combination. So I can talk and drink while knitting, with little worry about going wrong in the pattern. With all that taken into account though, it still creates an airy, interesting, and textural fabric. I love it! And yes, I am knitting with something that is the equivalent gauge and density of sewing thread on that spool. Would you expect anything less of me at this point? It does look airy. Nice for cool but not cold weather. I’m picturing it being worn more as a splash of colour on an outfit, or replacing jewellery rather than for warmth. So it should be wonderful for a Summer evening. WOW! 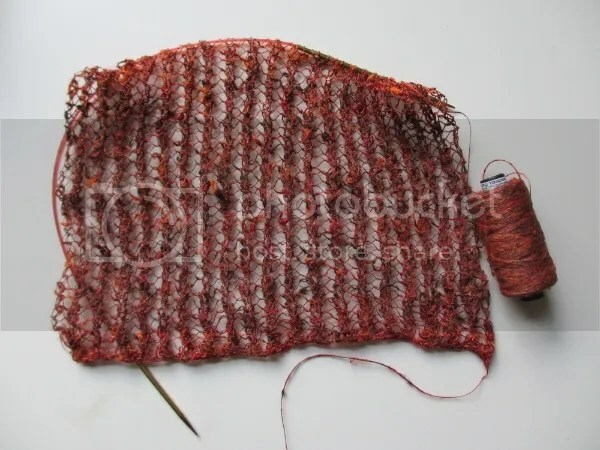 But remember all that pur science – air is a great insulator – so it must be good for a winter evening shawl! !